Italian painter, the son of a minor painter, Sigismondo di Pietro Marinari, from whom he received his first tuition, and the cousin of Carlo Dolci, whose best pupil he became. Sources mention him assisting Dolci in the later 1650s. While he remained capable of imitating closely his master s style, he was later influenced by Pignone and Furini. He executed a number of altarpieces for Florentine churches and his fresco in the Palazzo Capponi, Florence, is dated 1707. In 1674 he published his illustrated Fabbrica ed uso dell Annulo Astronomico. A self-portrait in the Uffizi shows him aged eighty-two in 1709. He died in Florence on 5 January 1715. There are few signed or documented works, and Marinari s oeuvre has still to be clearly defined. 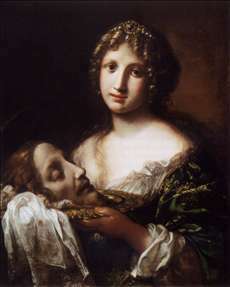 See more details about "Salome with the Head of the Baptist"